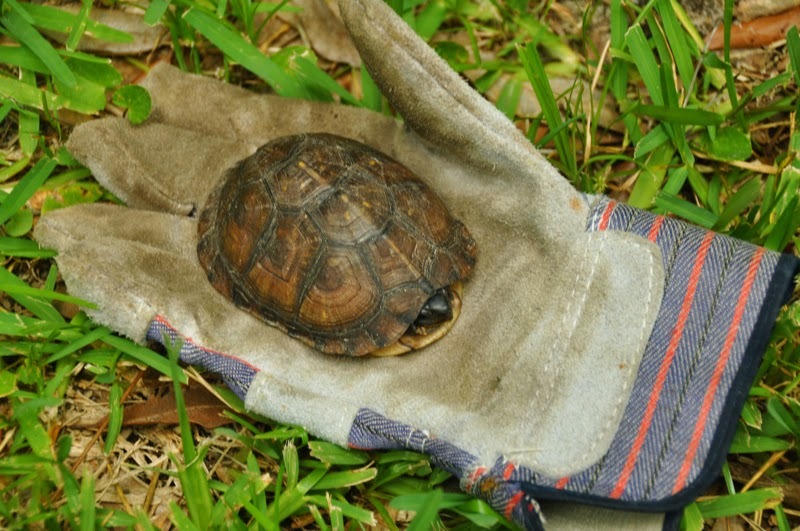 Husband Walter discovered this not-quite-grown box turtle in our yard recently. It was about three and a half inches long, a lot smaller than a couple other turtles sharing our address. Hubby thought the youngster might be offspring of two turtles doing a turtle tango outside our kitchen window one spring morning in late April. A Georgia Museum of Natural History article on box turtle natural history here said that mating can occur anytime between March and November. Mom usually lays 4-5 eggs in a flask-shaped nest in a sandy or loamy location that is open and elevated. The article also said that eggs hatch in about 70-80 days, usually September through October. The hatchlings may overwinter in the nest. Those facts eliminate the theory that Junior was the result of the amorous turtles’ 2014 spring fling. He still could be their offspring from an earlier season. What we do know for sure is that Junior is a survivor. 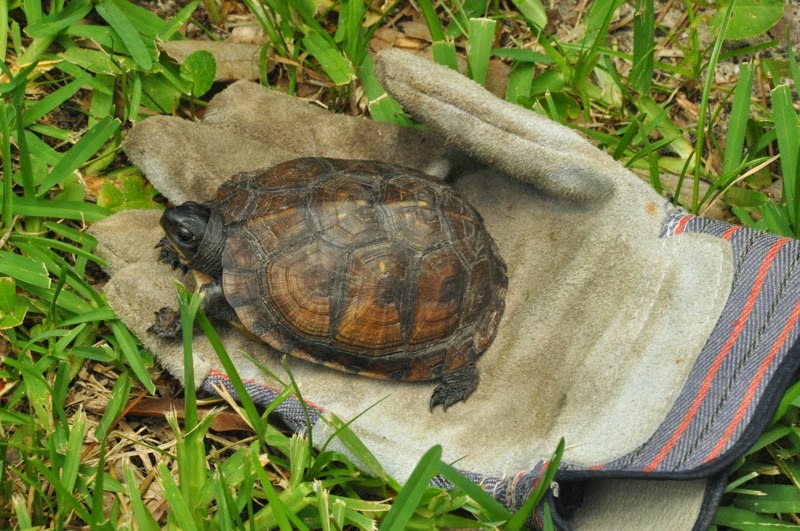 Hatchlings are usually 1 inch to 1.3 inches long, just the size to make a tasty snack for raccoons, snakes and all sorts of other predators that have adapted to small-town living in our neighborhood. And, according to the museum’s Internet article, it will be 5 to 10 years before Junior becomes interested in reptilian romance. Best wishes on continued survival, Junior. Thank you to Husband Walter for photos. I hope he continues to survive. I love the way you photographed him in the glove. Will you be feeding him once in awhile? Have you named him Junior? Great photos and info about Junior. I like the perspective of the glove and he. They certainly have a long life span. Fascinating. Your Hubby does such a great job with the photos. he is so cute or she is, whichever. 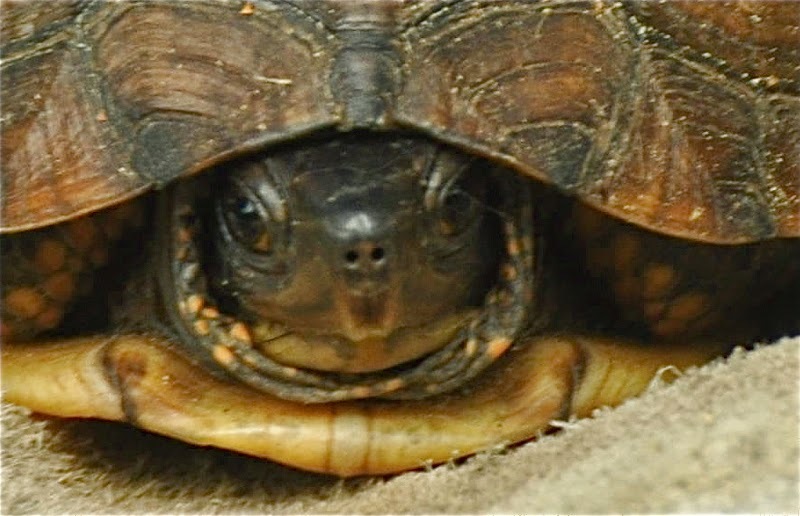 we have had many box turtle residents held captive by my 2 sons when they were growing up... did not know any of this info back then. 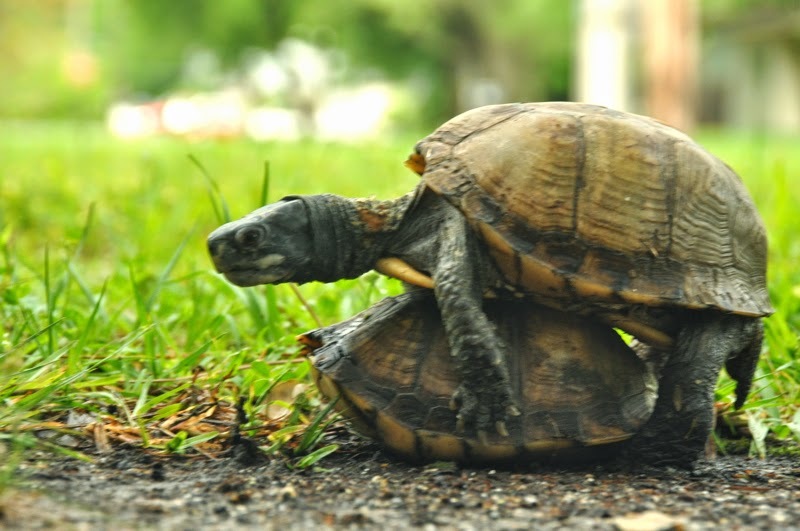 no internet to look things up..
Well, I always kind of wondered about turtle love. Goodness. What a cutie and I hope he will be around long enough to reproduce. How neat to have them in your yard. PS Those are wonderful shots. Oh I hope he makes it. I love tortoises. He's so incredibly cute! I like how you showed his true size by placing him on the glove. Oftentimes it's difficult to tell the size of something in a photo unless another object of known size is placed beside it. Best of luck to the little critter!